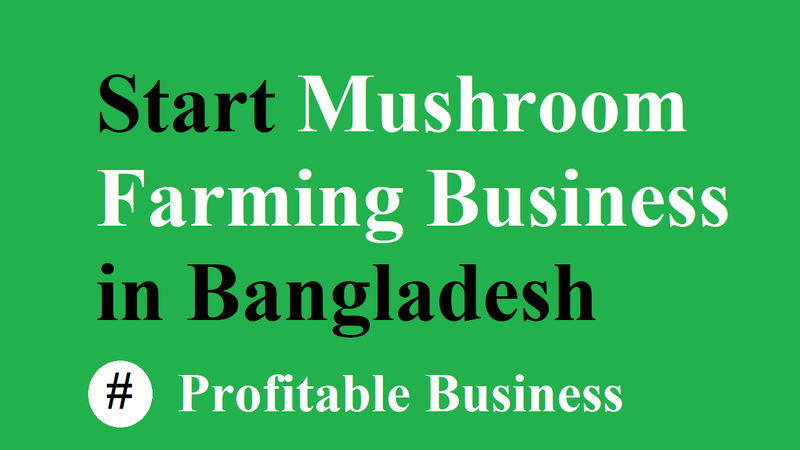 Since mushroom farming business is being continued for three decades in Bangladesh, entrepreneurs do understand its possibilities and value. But, there are still low and somehow no consciences for mushroom consuming for the people of Bangladesh. As a result, many mushroom businessmen have failed and lose their capital as well. That’s why you need to start a fully export-oriented mushroom growing, processing and freezing plants. While creating more job opportunities with more big entrepreneurs taking the challenge in hand, the objective is to bring an agro-revolution in the country and to build up the nation. In this case, mushroom cultivation can become a good source of income from the domestic market for the small entrepreneurs. Because of low capital investment, it may provide livelihood to many poor families. As Mushroom is the most popular nutritious, delicious and medicinal vegetable in the world, it’s a large reproductive structure of edible fungi. And because the climatic condition of Bangladesh is completely suitable for mushroom cultivation, it’s now one of the promising concepts for crop diversification in Bangladesh. Moreover, it doesn’t need any cultivable land and can grow in a room by racking vertically. That’s why it provides more benefits in per unit than any other vegetable in Bangladesh. Also, it not only requires a short time but little capital and easy technique for cultivation. Apart from these, any type of people can participate in its cultivation from male, female, youth, old, children to disabled. Besides, this is one of the best ways to end up unemployment problem in Bangladesh. Allowing personal consumption or the start of a commercial enterprise, mushrooms can be cultivated on a small and large scale. All short of people, from young to elders and even disabled can do its cultivation. Since mushrooms grow under the shade, chronically ill or weak people can work in a cooler environment. It’s easy to cultivate and someone can do it with rice and small fruit. The range in types of mushrooms and cultivation techniques can prove challenging and gratifying for people interested in experimenting. People with various needs, diverse interests and specific capabilities, mushroom cultivation offers a wide range of activities most suitable for them. It requires a very low cost. Within 2 to 4 months, mushrooms can be produced and sold and many more. Although the mushroom farming business is easy to look like, it may somehow difficult. That’s why many mushroom businesses have failed to initiate in the early stage of the business. You should either have enough knowledge in this business or you need to get proper training on this issue if you want to be a success. If you’re in lack of sufficient knowledge then you should get training. Grass-thatched mud house is the most appropriate and cost-effective structure for mushroom production. In this case, an (8X10) feet structure is enough to grow mushrooms. Even, some mushroom farming businesses those make a (5 by 8) ft chicken coop, which made into a mushroom house. Keep in mind that you should ensure the house is rodent-proof to keep off rats. Also, before introducing some light, later on, it has to be initially dark. And mushrooms need the humid environment to thrive as they have 80 to 90 percent water content. So, sprinkle water in the room throughout the day to achieve that. You need the spawn, which is basically the mushroom ‘seed’ to start off a mushroom farming business. Although domesticated mushrooms are not grown in soil, in a substrate, which is what you mix the spawn with. There is an agricultural waste while making the substrate. As it requires little space and simple structures, Mushroom farming business is cheap. For example, you can buy one kilogram of spawn less than BDT1000, which is enough for approximately 40 bags. And using one bag of spawn, you can produce 2 kg to 2.5 kg mushrooms. Soak it in water overnight or for two days with shredding in the agricultural waste. Mix it with supplements like wheat bran or maize bran after wetting it. By placing it over constant heat for six hours, pasteurize the substrate. Because mushroom is a decomposer and you do not want anything, pasteurizing kills micro-organisms like bacteria. Or as this would destroy the crop, grow other than your edible fungi. Mix it with the substrate inside the bags when the substrate has cooled, inoculate. After that place them on the shelves and incubate them for two weeks without touching them while taking the bags to the house. The substrate will be colonizing until it turns completely white during these two weeks. Now, make small holes around the bags so that the mushrooms can start sprouting when that happens. After making the holes, introduce a bit of light. And as you should ensure to make the room humid, you should sprinkle water throughout the day. In this time, the temperatures should also be between 18 to 21 degrees. To ensure temperatures are right, you can use a thermometer. There is no alternative to keep your mushrooms hygiene as they thrive on it. And when pasteurizing, you should be careful. A farmer should ensure their hands are sterile when inoculating the spawn to achieve that. Moreover, you should make sure that the house is free of the pest. It will spread to all the other bags and that crop will be lost if one bag is contaminated.